Product prices and availability are accurate as of 2019-04-17 05:23:24 EDT and are subject to change. Any price and availability information displayed on http://www.amazon.com/ at the time of purchase will apply to the purchase of this product. 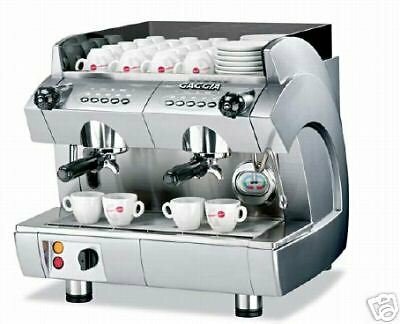 THIS SALE IS FOR 1 BRAND NEW GD COMPACT 2 GROUP AUTOMATIC ALL SILVER "MADE IN ITALY" AUTOMATIC COFFEE WILL BREW AND STOP AT DESIRED AMOUNT 732-643-9133 GAGGIA 2 GROUP AUTOMATIC ESPRESSO CAPPUCCINO MACHINE MADE IN ITALY COMMERCIAL GRADE UNIT IS 22O VOLT 50-60 HZ UNIT COMES WITH A SPECIAL CUP WARMING FEATURE UNIT WILL INCLUDE 2-GROUP HANDLES (1 SINGLE 1 DOUBLES) 1-DOSING SPOON 1-MANUAL TAMPER 1-DRAIN HOUSE 2-EXTRA PORTAFILTER HOLDERS FOR PODS 1-BACK WASH PLATE 1-CLEANING BRUSH 2 EXTRA THERMOSTATS 1- YEAR WARRANTY PARTS BOILER 4.9 LT WIDTH 21" HEIGHT 20" DEPTH 21.5"